Loose parts are natural or synthetic found, bought, or upcycled materials-acorns, hardware, stones, aluminium foil, fabric scraps, for example-that children can move, manipulate, control, and change within their play. Loose parts are alluring and beautiful. They capture children's curiosity, give free reign to their imagination, and encourage creativity. 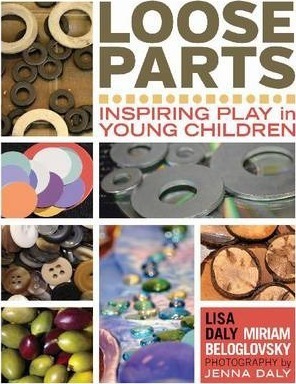 With more than 550 color photographs of many kinds of loose parts in real early childhood settings, classroom stories, and a dynamic overview, this book provides inspiration and information about the ways loose parts support open-ended learning, enhance play, and empower children. With loose parts, the possibilities are endless. "Loose Parts is a vividly and artistically photographed book that demonstrates how using natural and recycled materials provide endless possibilities for children to develop creativity and deepen critical thinking and problem solving. This book provides beautiful examples on how materials can be displayed to develop creative environments. Loose Parts is a great resource for teachers, early childhood trainers, and parents to consider in providing environments that engage and inspire children to explore, analyze, and create! --Margie Perez-Sesser, MA, Perez-Sesser Early Childhood Consulting "Loose Parts provides an inspiring path to childhood creativity that eschews our current throwaway culture by celebrating the inspiration and fun that come with using diverse, free, and found objects for multiple outcomes. This invaluable book will motivate experienced educators to push the reset button on long-held values that encourage children to manipulate their environment in order to learn, while introducing those new to the field to the enthusiasm, engagement, self-confidence, and joy that accompany open-ended play." "This book is a well thought insight to bring forth the best in children and to scaffold those who strive to support their journey for creativity and imagination. The vibrant illustrations and the diversity of materials presented provide a vision to create an environment that honors, supports, and values children. The possibilities of children engaging in play are endless and it is comforting to gain a deeper understanding of loose parts and how children think, therefore to be more purposeful as well as to be cognizant of how our actions and choices influence young children." Lisa Daly, MA, is professor of early childhood education at Folsom Lake College in Folsom, California, USA, and passionate about creative arts. Miriam Beloglovsky, MA, is a professor of early childhood education at Cosumnes River College in Sacramento, California, USA, and has had the pleasure of advising and guiding students for over 25 years.